The Nikon 70-200mm f/2.8 vr ii lens is my most used lens. If I'm shooting portraits, I have the 70-200 on my camera or with me for the shoot. It has a fast aperture for low light and blurry backgrounds, and the focal range of 70 all the way out to 200 is extremely versatile. The Nikon 70-200 is almost always rated the best 70-200 on the market (even better than the Canon), but new competitors such as the Tamron 70-200 are far less expensive and offer 99% of the quality. The question of whether to choose this lens is not so much a matter of if you want it or not. Trust me, you want this. The question is if you're willing to pay the premium for this lens when the Tamron is so close to the exact same thing for a lot less money. The only real negatives to this lens (other than the price which I've mentioned) are the weight of the lens and also the fact that creative sun flare has never looked real great on this lens in my experience, which is relevant if you like shooting natural light portraits. Also, I find myself wishing it had a better close focus distance (1.4 meters – 4.6 feet). It's an improvement over the older version of this lens, but I still wish it were shorter. Who Should Buy this lens: Professional photographers who are willing to pay a premium for the ultimate lens. While this lens is most popular among portrait photographers, it is also an excellent choice for indoor sports photographers because of the fast aperture and snappy focus. Sharpness: This lens is probably the sharpest telephoto zoom on the market from any lens manufacturer. It is the gold standard. Though it is not perfect, it's rather incredible to see this level of sharpness from a fast zoom. When you buy a prime lens with an average maximum f-stop, you expect sharpness; but on a lens such as this, getting perfectly sharp images throughout the range is a tremendous feat of engineering. I tested this lens at 200mm to find where the sweet spot in the aperture is, and found the sharpest result at f/7.1, but even wide open it performs extremely well. Oh, and nevermind the fact that the newspaper in the test below is upside down. It gives the test character. Vignetting: Personally, I have never found vignetting (darkening around the edges of the frame) to be an issue in the least, but Ken Rockwell's test revealed some vignetting when zoomed in to 200mm. Chromatic aberration: I have never seen any significant chromatic aberration on this lens. This is thanks to the 7 Extra-Low Dispersion Glass elements in the lens. Flare: This one is tough to explain. This lens is quite resistant to lens flare in general, but sometimes I find myself wanting to shoot portraits with a little creative sun flare behind the model. The lens resists a little sun flare, but if there is a lot of light pouring through the lens it has a tendency to make the entire image turn yellow/orange. This really isn't the best lens for creative sun flare. This lens does not do well as a close up lens. It does better than some other 70-200mm lenses and it does better than the VR 1 version of this lens, but I do often find myself wishing I could use this lens for a quick macro of the bride's ring or a flower when out shooting. The problem is not so much the close focus distance, but that the focal length is not as advertised when focused up close to the lens. 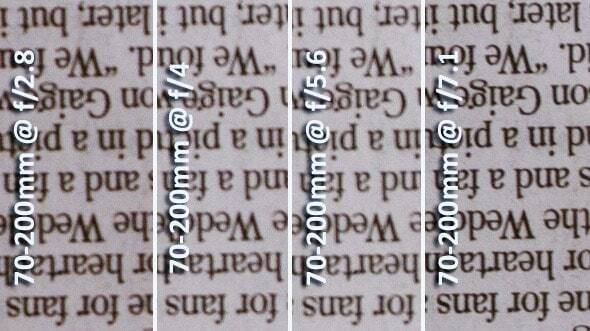 Some reviewers found the actual effective focal length to be around 134mm when zoomed in all the way and focused as close as the lens can focus (1.4 meters). Works perfectly on any Nikon DSLR. Works well on both a full-frame or a crop-sensor camera. In fact, I really like this lens on a crop sensor camera because I love the 105mm to 300mm focal length. This lens is built like a tank. Seriously, it's incredible! Just take a glance at this thing and you can see why it costs so much. The most important part of the lens build quality is the fact that this lens is fully weather sealed. That doesn't mean it's waterproof, but it does mean that it's unlikely that you'll get an excessive amount of dust between the lens elements, and it means that you can be out shooting in a pretty decent downpour of rain without worrying too much. Having a weather sealed lens is also important because you don't have to worry when shooting in humid environments (like the beach or a swamp or shooting on a hot day after a rain shower). You'll also notice the metal construction of the lens body and rubberized grips over the zoom and focus rings. While I do wish the lens could be built lighter, it's nice to know you have a lens built with solid materials. One major consideration when purchasing this lens is the overall weight. This lens weighs 54.3oz (1540 grams). That's about the same weight as an average text book. Many of the students in my online photography classes ask me what the best portrait lens is, and I always point to the 70-200. The only time I've had a student come back to me and say they don't like this lens is when they say it's just too heavy to carry around for a shoot. So the biggest consideration here is whether you're the type who wants the ultimate in image quality, or if you are the kind who wants portability and a system that won't get in the way as you travel or walk around with your camera. Compared to 70-200mm f/2.8 lenses from other manufacturers, this Nikon version is slightly heavier. For comparison, the Tamron version of this lens is 4.5% lighter, and the Canon 70-200 is about 15% lighter. After posting this review, here's what a few readers of the site had to say on the Facebook page. I agree with them. The versatility of this lens is perhaps its best quality. Many photographers enjoy shooting with prime lenses because they are usually fast and sharp. The 70-200mm lens acts like a prime lens… but at different focal lengths. It's sharp and fast like a 70mm prime. It's sharp and fast like a 200mm prime, and it's sharp and fast at all the focal lengths in-between. The 70-200mm is generally used for portrait photography. In fact, you'd be hard-pressed to find a wedding photographer who doesn't use one; however, that is not to say that it is only useful for portrait photography. If you shoot indoor sports such as basketball, wrestling, swimming, or gymnastics, the 70-200 is an excellent option because of its relatively telephoto focal length and fast aperture for light gathering. While I personally don't use long lenses for landscape photography very often, Michael Fry (one of the premiere landscape photographers in the world) uses his 70-200 for landscapes all the time. In fact, it's his favorite landscape lens. Getting data about durability of lenses can be tough because few photographers own more than one copy of the lens, so all evidence is anecdotal; however, data from LensRentals.com which owns a large number of these lenses shows that this lens is less durable than you might think, given the solid build quality of the lens. The three most common problems they saw with the lens are (1) Jammed zoom, (2) Optical issues, and (3) Footplate issues. There is no doubt that this lens is extremely expensive at over $2,000 (US); however, for professional photographers or advanced amateurs who want to know they have the very best, this is it. Roger Cicala from LensRentals noted that the lens hood for the 70-200 works great when placed forward in shooting position, but does not always lock into place when in reverse. I haven't personally found this issue on my copy of the lens hood, but LensRentals sees enough of these that it's likely a common issue. Ken Rockwell noted that the vibration reduction on this lens gives about 3 stops of better performance than if there were no vibration reduction. Nikon advertises 4 to 5 stops. DPReview noted that this version of the lens is sharper at the corners when shot with a full frame camera, but that the sharpness is equal to the VR 1 version of this lens when shot on a crop sensor (APS-C sensor) camera since the corners are not utilized on these smaller sensors. Gordon Laing praised the focus speed of this lens–giving it a rating of .6 seconds to acquire focus from infinity to 1.4 meters. Nasim Mansurov (who writes excellent, in-depth reviews) praised this lens in combination with the Nikon 1.4x teleconverter. I was interested to read this because my experience has been the opposite. This leads me to wonder if the problem is with my particular lens/teleconverter copies. DXOMark finds that this lens is sharpest at 135mm and f/2.8. I can agree with the 135mm as a sweet spot, but my own testing shows f/7.1 to be sharper. AF-S means that this lens has a silent wave motor. From a practical standpoint, this means your lens will focus quickly and accurately. It also means that if you use a less expensive DSLR without a focus motor (such as the D5300, D3200, etc) then you will be able to still autofocus with this lens. Nikkor means that this lens is made by Nikon. Why can't they just call them Nikon lenses? Because they can't. f/2.8 signifies that this lens can open up to a large f/2.8 aperture and shoot at that aperture when zoomed out or zoomed in. That's excellent for low light shooting. ED means the lens has some “Extra low dispersion” glass elements in the lens, which reduce chromatic aberration. VR means this lens has vibration reduction built into the lens. This is a technology that counterbalances the natural tremble of your hands to allow you to shoot in low light with slow shutter speeds and still get sharp shots. II means that this is the second version of this lens. The original version of this lens was good, but the vibration reduction is better on this version, it's a tad sharper at 200mm, and this version fixed the vignetting problem that was evident on the original version. Focal length: 70-200mm is what Nikon advertises, but take notice of comments above about the effective focal length at different focus distances.